This one bedroom, two bath condo is 1026 square feet, can accommodate up to four people and is located on the third level of the Upper Borders Building. This moderate unit features standard furnishings, fully equipped kitchen, a table that seats 6 people, washer and dryer and a gas fireplace in the living room accented with agate rock and a wooden hearth. The entry-way, kitchen and bathrooms feature slate flooring with carpet throughout. Relax outside on the spacious balcony and take in the fresh mountain air and Beaver Creek Mountain and tree views. Bedding includes a queen and twin sleeper sofa in the master and a queen sofa sleeper and a twin sofa sleeper in the living room. Complimentary wireless internet is available throughout. 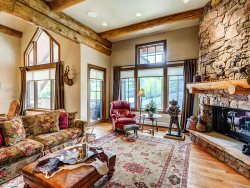 Property Description: Steps from the Beaver Creek Village, The Borders Lodge is located on a hillside with ski-in/ski-out access via the Elkhorn Chairlift adjacent to the Lobby door. Enjoy the quiet and comfort of a private residence with the personal service and amenities of a hotel. Choose from a studio to a comfortable one, two, three or four bedroom condominium all with a gas fireplace, washer and dryer as well as a private patio and expansive mountain views. The Borders Lodge features two buildings Upper Borders and Lower Borders and the condos are available by category, Moderate, Deluxe, and Superior reflecting the quality of unit furnishing and finishes. The Borders Lodge is a true mountain retreat, with a heated outdoor pool, hot tubs, fitness rooms, heated covered parking, complimentary WIFI and complimentary coffee bars in both buildings.